PREHEAT oven to 400° F. Grease baking sheets. COMBINE flour, sugar, baking powder, baking soda and salt in large bowl. Cut in butter with pastry blender or two knives until mixture resembles coarse crumbs. Stir in morsels. Stir in buttermilk with a fork just until moistened. Knead 2 or 3 times on floured surface. Pat to 3/4-inch thickness. Cut into sixteen 2 1/2 x 2 1/2-inch diamonds; place on prepared baking sheets. CUT one shortcake in half horizontally. Spread bottom half with whipped topping; top with strawberries. 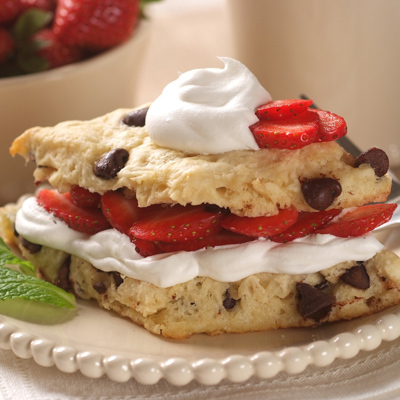 Cover with shortcake top; layer with more whipped topping and strawberries. Repeat with remaining shortcakes. Serve immediately.